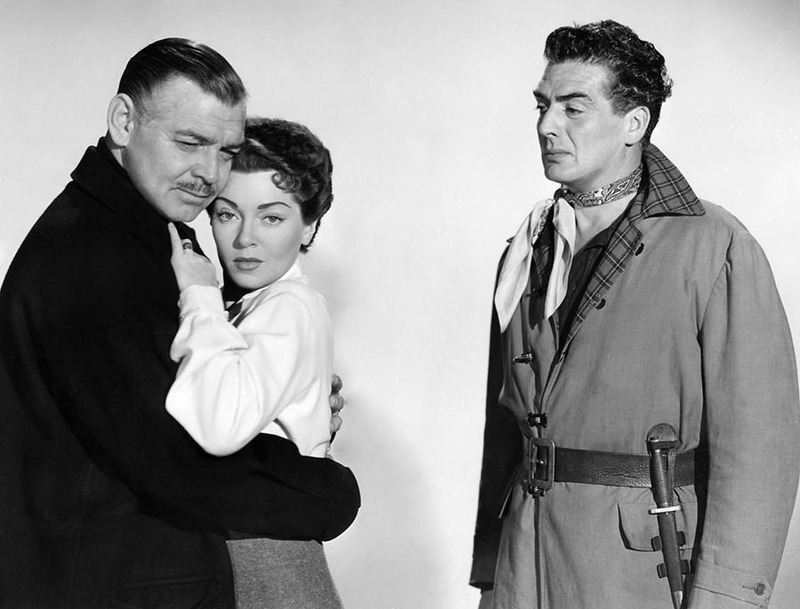 Clark Gable played his final role for MGM in this WW2 spy thriller alongside Lana Turner and Victor Mature. 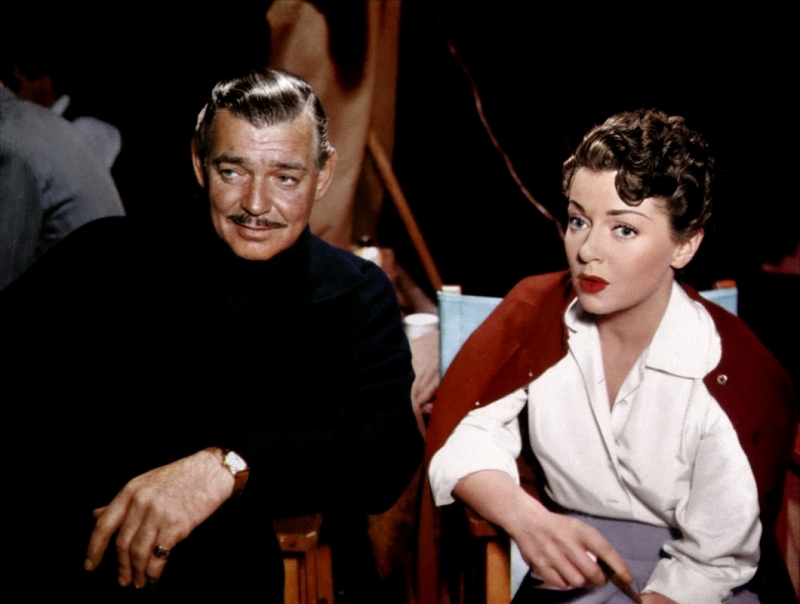 Gable rose to prominence and iconic stature under the MGM banner and everlasting fame as Rhett Butler. 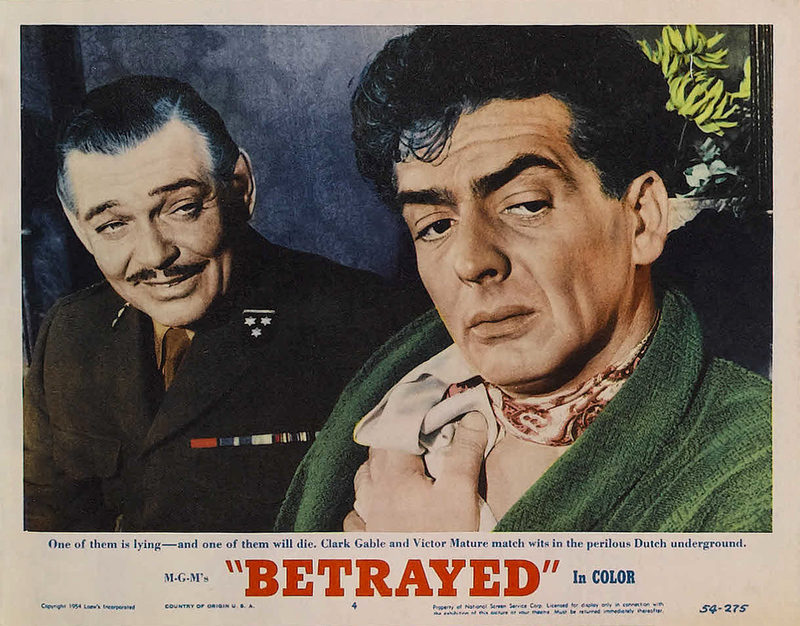 Looking a bit older than the role calls for, Gable plays a spy captured by the Nazi’s who is rescued by Victor Mature’s underground resistance leader in the Netherlands. It’s a brazen daylight rescue mission with Mature playing it rather “broadly” as he confiscates a bottle of wine while throwing an injured Gable over his shoulder as he makes his getaway. Tugboats and a windmill hideaway are utilized as Gable makes his way back to England and commanding officers played by Louis Calhern and Wilfrid Hyde White. The German’s retaliate by killing three prominent citizens when Gable isn’t returned to his captors. One of the men killed is the husband of the well to do Lana Turner who will turn to Gable and company to seek her own justice by helping the war effort in any way she can. This leads her to spy school under the watchful eye of Gable. Yes, romance is sure to follow for the recently widowed Lana sporting a brunette look for this Gottfried Reinhardt directed feature. British officer Ian Carmichael has designs on the Hollywood beauty but let’s be honest, he’s out of his league. Way out of his league. Lana’s mission is to be flown back into enemy territory and work as a schoolteacher who is friendly with the invading forces while passing on vital information to the overly cocky Mature. Wide grinned Vic will then lead his ragtag group of volunteers on nighttime raids with the intent of upsetting the German war machine by killing as many soldiers as possible. This includes Anton Diffring and a blink and you’ll miss him Ferdy Mayne. Lana will even get a chance to sing a torch song to the enemy forces as they take in a night of partying before Vic’s forces lay them out. Might she be dubbed? Honestly I’m not sure one way or the other. Gable is overseeing the reports and things are becoming all too obvious that there is a traitor amongst the set up. Someone is setting up Mature’s raiding parties and they’re taking heavy losses on each outing. Gable is convinced that Lana is a double agent and he’ll personally handle the situation going back into the heart of enemy territory. Lana’s overjoyed to see Clark at first but discovers his reason for the journey and does her best to convince Clark of her own suspicions concerning the heroic Mature who never seems to catch a bullet. It’s a tangled web of deception that will play out over a lengthy running time of 108 minutes before all questions are answered and Lana can move on to her next movie role sporting her customary blonde haired look. This one is strictly watchable for the star power involved and if one wanted to be critical, it’s rather easy. 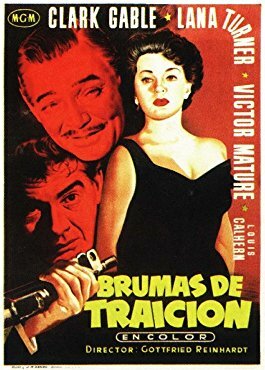 I’m not one to cut films up but I will say Gable looks old and weathered here, Lana is desperately in need of her blonde look and if it’s to be believed that Victor Mature was a ham actor, look no further than Betrayed as proof. But the heck with all that, I like all three of them so I still find bits of enjoyment even if it’s a forgettable feature in the careers of those involved. 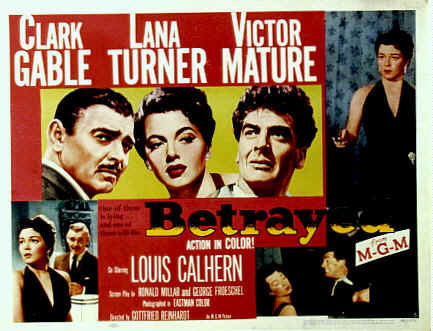 Betrayed was the fourth and final time that Gable had Lana as his leading lady. The others being Honky Tonk, Somewhere I’ll Find You and Homecoming. All three titles coming from the previous decade. My biggest chuckle in the film comes when Gable is offered a cup of tea alongside his British co-stars. He gives it a snarly almost manly look and says, “No, give it to him.” I smiled here because I’d say the same thing and I come by it honestly. In my house growing up, Dad drank coffee and Mom drank tea. By the time I left the nest and got married off, I was pretty much convinced coffee was a man’s drink and tea went to the ladies. So Gable mirrored my own reaction when I find myself in similar situations. I tell this story with all due apologies to the male drinking tea population who stop in here. 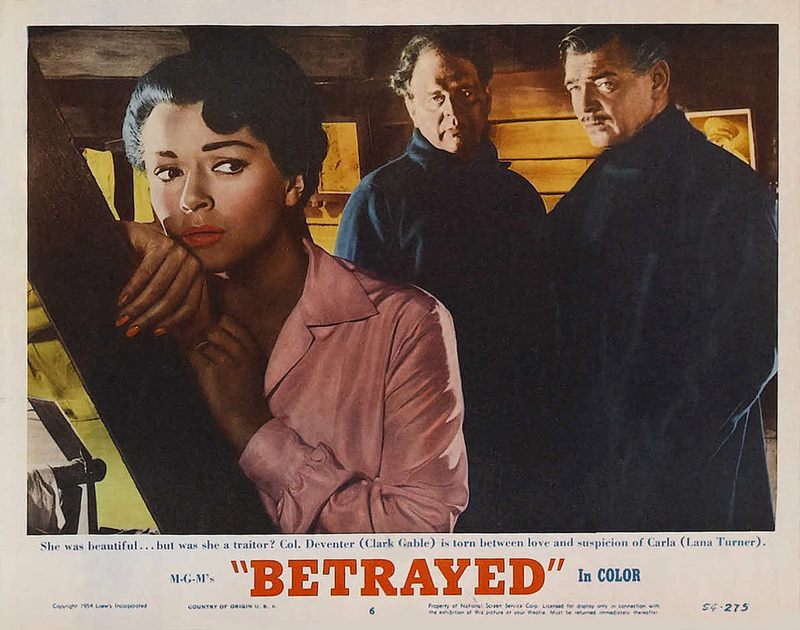 You might catch Betrayed on TCM but if you’re a collector like me, you can pick up a copy via the Warner Archive Collection. 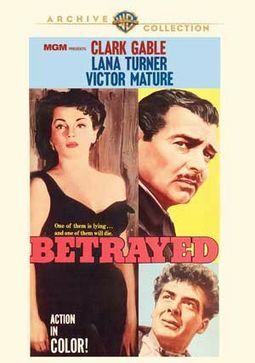 Like you I found Betrayed quite enjoyable . Your photos are terrific – so clear. Net surfing for pics. Won’t take credit. Enjoyment is what it’s all about and this one fits the bill.